One of the more modern pieces in this classic cottage collection, this upholstered swivel stool features a soft and decorative design style that incorporates the smooth modern lines of the transitional furniture movement. A sturdy frame craftsmanship made of quality constructed metal creates the outer lines of this chair's body from its lean tapered legs to its seat base and back. Lightly padded cushions on the seat and lower back create a comfortable sitting experience while an exposed wood backrest adds definitive country style. 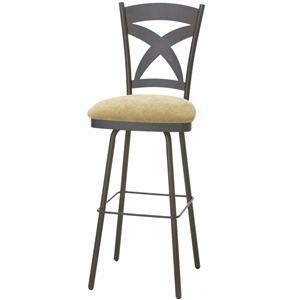 A transitional piece with a slight hint of country, this bar height stool is available in a swivel and non-swivel option in 26", 30" and 34" seat heights. 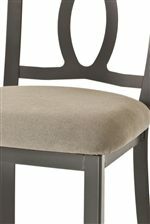 This piece is also available as a dining room arm chair and dining room side chair. The Countryside 34" Eleanor Spectator Height Swivel Stool with Upholstered Seat and Back by Amisco at Colder's Furniture and Appliance in the Milwaukee, West Allis, Oak Creek, Delafield, Grafton, and Waukesha, WI area. Product availability may vary. Contact us for the most current availability on this product. There's nothing better than relaxing in a cozy, comfy nest. Your home should help you capture that sensation as you unwind and reconnect. The Countryside collection offers classic and timeless lines that work together in all settings. The metal designs and motifs present in the collection evoke a flea-market feel, while still coming across as high-end, sturdy, and sophisticated. You will surely feel at home and showcase your love for country charm with this beautiful collection. The Countryside collection is a great option if you are looking for Cottage furniture in the Milwaukee, West Allis, Oak Creek, Delafield, Grafton, and Waukesha, WI area. Browse other items in the Countryside collection from Colder's Furniture and Appliance in the Milwaukee, West Allis, Oak Creek, Delafield, Grafton, and Waukesha, WI area.